Inspired by family, friends, and home, I create stories in cloth. My narrative quilts begin with unique, hand-dyed fabrics. These become whimsical wall pieces that reflect a joyful and colorful life. All pieces are of Laura’s original design, made from her hand-dyed cotton or silk fabrics, fused applique, and machine quilted. Art quilts come with a hanging pocket for display. Read about quilt care and display here. 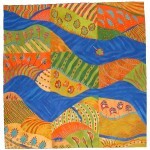 For more information about purchasing an art quilt, please email Laura at laura@artfabrik.com. Payment plans are available.